last week i was out with a friend of mine who wanted to learn more about photography. she had an old Fujica SLR with screw mount lenses that was given to her, and she needed a bit of a lesson. after taking a evening stroll around Stanley Park, talking about how shutter speed and aperture affect light, we decided to have some fun. it was getting dark, and she asked me if i knew how do paint with light. 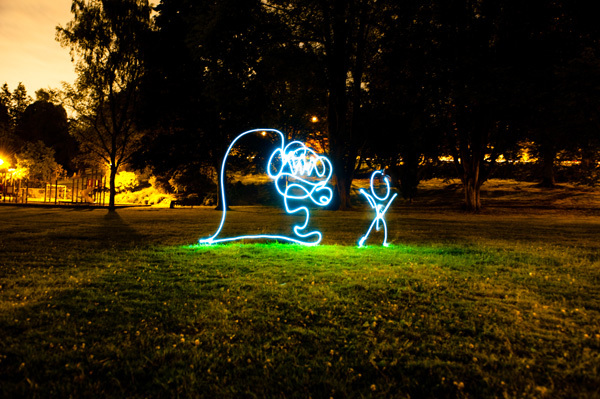 i haven’t done any light painting in a long long time. we grabbed some Tims and headed to a small park. this was my favorite picture from the night, the monster and the man.